From the very beginning Morecambe Euston Road station was busier during the summer months when numerous excursions ran. During the winter months the service was more local in nature. The December 1895 timetable showed nine arrivals and departures on Monday-to-Friday as seen in the table below. There was an extra train in each direction on Saturdays and no Sunday service. The fact that by 1891 four additional platforms had been provided demonstrates how busy the station was during the summer months. The July 1922 timetable showed 22 scheduled departures on Monday-to-Saturday and ten on Sundays. There would have also been excursion trains throughout the summer months. The LMS summer timetable for 1932 showed 26 departures from Morecambe Euston Road on Saturdays. As well as frequent service to Lancaster Castle trains served destinations including Barrow-in-Furness, Crewe, Manchester Victoria, London Euston and Windermere. The last LMS summer timetable of 1947 showed 16 departures and 15 arrivals on Monday-to-Friday as seen in the table below. There were four extra trains in each direction on Saturdays and one extra on Thursdays. The service was mostly of a local nature but there were trains to and from London Euston and Windermere. By the summer of 1953 there were 25 departures from Morecambe Euston Road on Saturdays. Even on Sundays there were 9 scheduled departures. There were 28 arrivals on Saturday and 9 on Sundays. Through trains ran to and from Barrow, Lake Side, London Euston and Windermere. During the 1950s BR (LM) followed in the tradition of the LNWR and LMS and promoted Morecambe as a resort. Handbills and posters were produced advertising the resort generally and also specific trains that ran to it. The proximity of Lancaster Castle station on the Anglo-Scottish main line meant that many excursion offers required a change of train there. The Sunday 15 August 1954 handbill to the left shows an example of an excursion train that operated between Carlisle and Blackpool North but which included Morecambe Euston Road as a destination. Interestingly, although the outward journey is advertised as depositing the Carlisle day trippers at Euston Road, they are told that the return journey must be made from Morecambe Promenade. The return journey could be made for the princely sum of 8s 9d. During the 1950s Morecambe Euston Road was a popular destination for excursion trains from the Merseyside and Manchester areas. During the winter period of 1956/7 there were 18 departures from Morecambe Euston Road, most of which ran only to Lancaster Castle. This was a good level of service considering that a frequent service also ran to Morecambe Promenade station. With the start of the winter timetable on 15 September 1958 all passenger services were diverted to run to Morecambe Promenade. From 15 June to 13 September 1959 passenger trains ran to and from Morecambe Euston Road on Monday-to-Sunday. On Saturday 8 August 1959 there were 23 departures and 26 arrivals as shown in the table below. In 1960 the station was served by passenger trains seven days per week from 13 June to 11 September. The following year, 1961, the services ran from 12 June to 10 September. 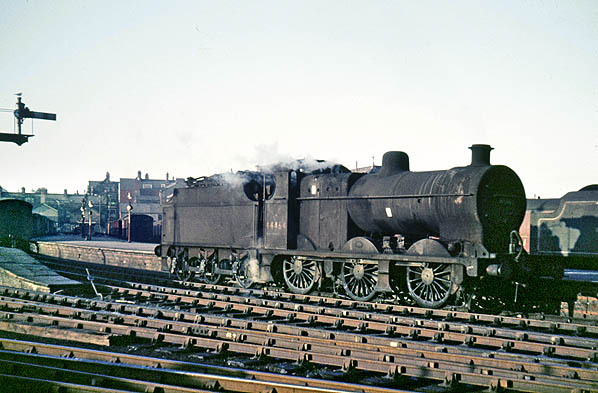 The last year that passenger trains used Morecambe Euston Road was 1962 when they operated from 18 June to 8 September. The very last passenger train departure from Morecambe Euston Road was the 4.25pm Lancaster Castle service. Morecambe Euston Road after passenger services had ceased in December 1963. The station pilot an ex-LMS Fowler 0-6-0 locomotive no. 44464 is seen standing at the eastern end of platform 3.